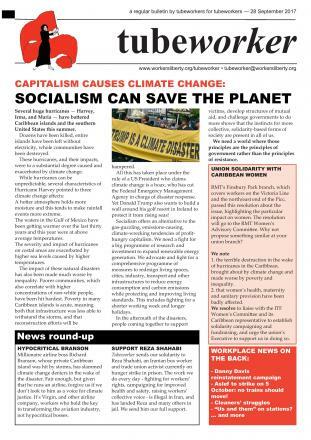 This issue includes an article on the need to defend migrants' rights post-"Brexit", and an item on standing up to the anti-Corbyn coup in the Labour Party, plus your local and workplace stories, including our regular "cleaners' column". This edition features an argument for a working-class "in" vote in the EU referendum, plus your local and workplace stories. This edition includes an article on the fight for disability equality following Iain Duncan Smith's resignation, an update on the Piccadilly Line drivers' strike, plus your local and workplace stories. This month's issue encourages readers to support the junior doctors' strikes, and looks back on the "resolution" of the dispute against "Fit for the Future". Plus, your local and workplace stories. This special edition of Tubeworker encourages readers to vote no in referenda on LU's pay/Night Tube offer. An updated version of Tubeworker, an industrial bulletin for London Underground workers, by London Underground workers.